We’re moving sacrificialferret.com to a new host – sorry for any availability issues that might pop up! Sacrificial Ferret Productions is proud to announce two new additions to our library! These two shorts are part of our public awareness campaign, “You Can’t Fix Stupid” and premiered at AGE Entertainment’s Heatwave 5 event on July 12th, 2008. You can find the Public Service Announcements in the Movies section. Enjoy! We’re in the middle of updating everything so please forgive the disorder. It’s been three years since anyone really heard a peep out of us. Get ready to see a new site design as well as a couple of new shorts. In case you’re wondering… yes, we’re still here! 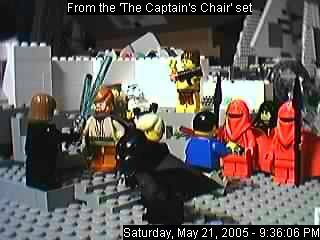 Due to several recent setbacks, production on “The Captain’s Chair” has been delayed. Production is expected to resume within the next couple of weeks. Also, we’re still looking for an individual with experience in CG animation. If you’re interested please email us at info(at)sacrificialferret.com. In honor of the release of Episode III on Thursday, the set cam will feature various visitors from the Star Wars universe. Scope out the thumbnail in the sidebar or check out the cam page. First, we’d like to announce that the script for our next production, “The Captain’s Chair” is complete! Filming is expected to begin within the next couple of weeks. Second, the sidebar now contains up-to-date stats on all projects that are currently being planned. Donate Legos here for a future project!